Went to my guild meeting last night determined to find out who made that adorable Santa ornament that I copied 36 times! (See Dec 30 post) So, as I was talking to one of my good friends, Liz, I showed her my quest. Wouldn’t you know it was she, who made them! That was easy! 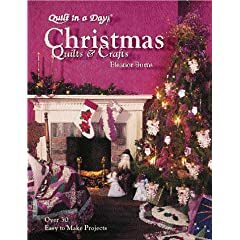 Turns out they originate from Eleanor Burns’ 1995 book Quilt in a Day Christmas Quilts & Crafts. Amazingly, it is still available at Amazon.com Didn’t realize she had so many books – 4 pages worth!!! Looks like I might have to invest in one more book, darn! Never too early to start getting ready for Christmas! Eleanor is definitely one of the grand dames of the quilt world, isn’t she! Writes a good book, too!